Whether your child is facing fear, dealing with injuries, or feeling overwhelmed by change Vision Boards can be a great tool in helping them to stay focused on their dreams and not dwell on their immediate problems. Vision Boards are a visual representation of the desires of one’s heart. These collages are created on poster boards, magnet boards, chalkboards, or cork boards, with word strips, magazine clippings, photos, and more. Ideally, Vision Boards are hung in a highly visible place, as a constant reminder of hopes and dreams that one is working towards or things one identifies with. Why are Vision Boards Useful? Vision Boards can motivate and inspire athletes even on the hardest of days. They can redirect thought by forcing attention to things gymnasts WANT. Vision Boards help define a purpose to an athlete’s efforts. Not every child loves the sport for the same reasons or wants to be the same kind of gymnast; a Vision Board allows youth to decide what is necessary for THEM. How can I help my Gymnast Create a Vision Board? Provide your gymnast with an array of magazines and images. Helpful gymnastics magazines include AUS Gymnastics, Victoria Gymnastics, and International Gymnast. You’d also be amazed at what you can find even in your junk mail! You can help your gymnast hunt online for images or sayings that speak to them. If your child has a specific trait she wants to emulate, print it in their favorite font. It is essential for your child to include how she wants to feel and what kind of gymnast she wants to be. Encourage her to use adjectives as well as nouns. The hard part can be depicting non-tangible desires. If your child wants to be happy, help them find a picture that evokes that emotion such as a sunset, a smiling face, a view of them during a happy moment, or you can use the word “happy” in the college. 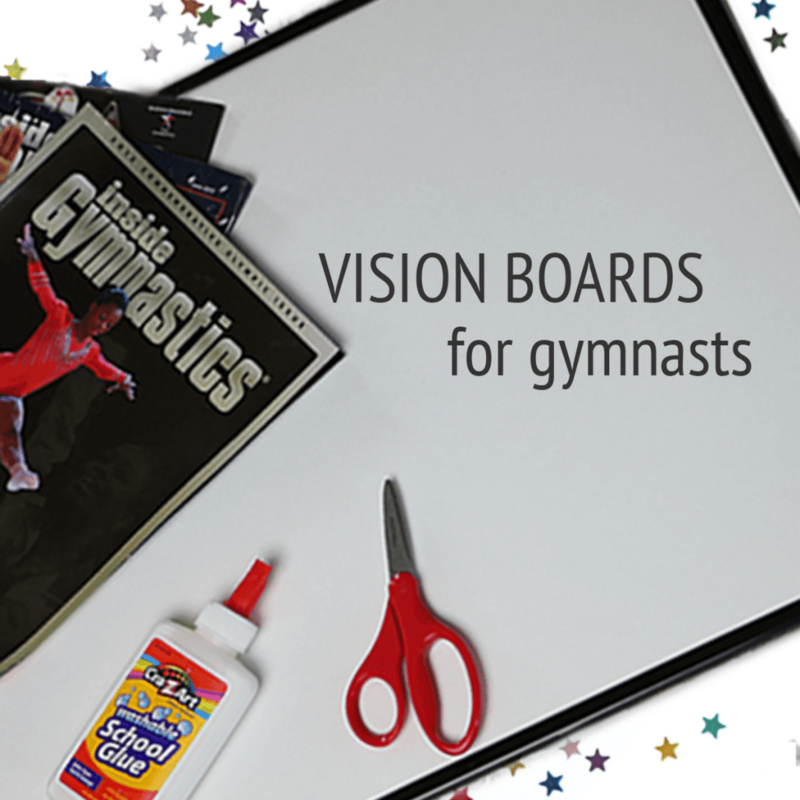 Encourage your gymnast to pick an item on her Vision Board. Have her close her eyes and imagine that her desire has already been achieved. What does it feel like? What emotion does it evoke? How did she accomplish the goal? Have her express gratitude for the experiences that delivered her dreams.